Comments: Marques is located on the north side of the Zocalo. This is the perfect spot for people watching and caeser salad is made from scratch at your table. Service is quick and friendly. Live music, performers, and the odd political rally add to the spectacle. The Doctor - Rio Minerals Ltd.
gotta see this! www.lapesca-fishing.com. All the pictures and info at this site. Comments: If you go there, chances are that you will run into some students, sometimes maestros,of the nearby Facultad de Ciencias de la Tierra de la Universidad Autonoma de Nuevo Leon - this bar is our favorite hangout. It is a geologists place, we are VERY well known there. Chuy the barkeeper will attend you well. Try the bandera - red green and white mexican flag (sangria for red, limon for green, and of course tequila for white). Satisfaction guaranteed. We do quality checks several times a week! Comments: The friendliest most welcoming group of people in a rural area. 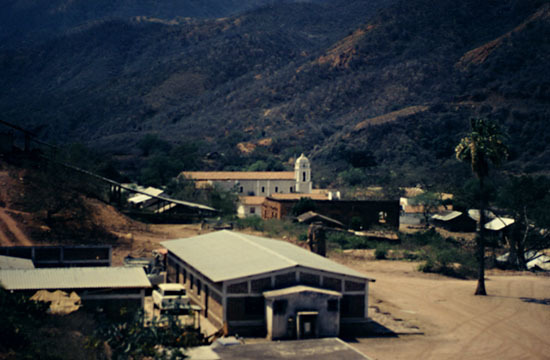 San Jose de Gracia, Sinaloa. From Guamuchil head east thru Sinaloa de Leyva and drive another 85 km into nowhere. Town has no utilities, but Adelmo keeps beer cold for gringo geos. Here is a photo of San Jose de Gracia, location of Adelmos beer porch. Comments: Take one shot now and three for the road because in this mining business you never know! Comments: A real pit of a miner's bar ... well named! Comments: Paela on Thursdays is excellent!!. Comments: Miss it if you can, alchohol is illegal and the homebrew is toxic, expensive and will get you in trouble with the local women.